On Tuesday, August 28, Sinai Temple held an event for Jews by Choice called The Real Taste of Judaism. 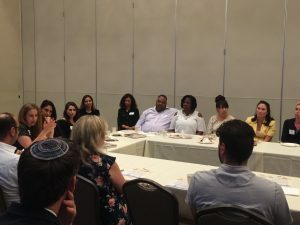 Over 30 recent Jewish conversion students, now all members of Sinai Temple, attended the event, led by Rabbi Sherman and Lara Rabinovitch, Phd, a specialist in food culture and immigrant history. The duo served as a complementary team. Rabbi Sherman welcomed our newest members, recognizing that each of our sacred journeys contributes to our community as a whole. Lara analyzed peoples’ associations of specific “Jewish” foods/dishes with emotions, memories and their developing religious identities. It was a beautiful evening of sharing and community connection. The group also enjoyed food from new Los Angeles restaurant Hasiba, which specializes in modern Israeli, Kosher cuisine. This unique and engaging program was the brainchild of our Membership Committee, in close collaboration with our clergy team. 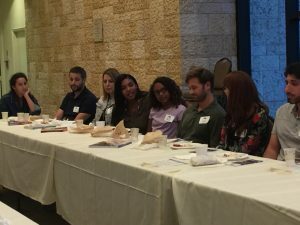 Leading up to the High Holy Days, it was our honor to provide a warm, friendly space for these new members to meet new people explore their new faith. To learn more about Sinai Temple programming for Jews by Choice, as well as our membership at-large, please contact Rebecca Small at rsmall@sinaitemple.org or (310) 481-3243.